This is our third year publishing the CxPi. The 2007 CxPi and the 2008 CxPi rankings were published in Q4. We decided to publish this year’s CxPi in Q1 2010, so we don’t have a 2009 CxPi. 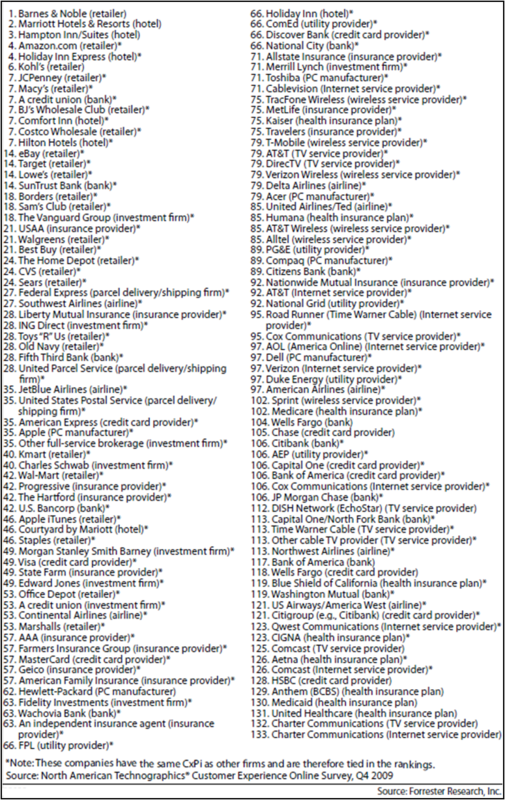 The 2010 CxPi ranks 133 organizations across 14 industries: Airlines, Banks, Credit Card Providers, Health Plans, Hotels, Insurance Firms, Internet Service Providers, Investment Firms, Parcel Shipping Services (new this year), PC Manufacturers, Retailers, TV Service Providers, Utilities (new this year), and Wireless Carriers. The CxPi is based on consumer evaluations during November 2009 across three areas: 1) meeting needs; 2) being easy to work with; and 3) enjoyability (see the methodology section below). Retailers take 12 out of the top 20 spots. Most of the top rated companies on the list are retailers. Hotels also grabbed three of the top 20 spots. Interestingly, three financial services firms also cracked the top 20: credit unions, SunTrust Bank, and Vanguard. 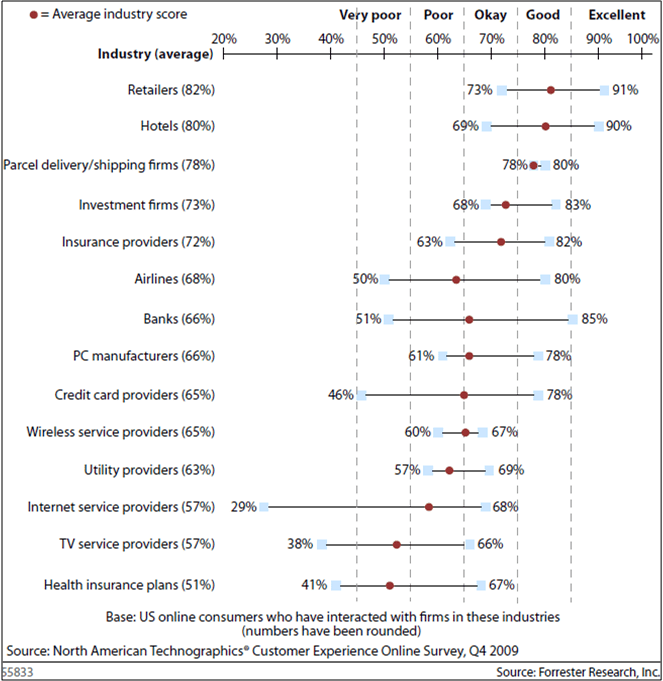 Healthcare, Internet and TV services dominate the bottom. The bottom 11 companies on the list came from only four industries: five health insurance plans (United Healthcare, Medicaid, Anthem, and CIGNA), three ISPs (Charter Communications, Comcast, and Qwest), two TV service providers (Charter Communications and Comcast), and one credit card provider (HSBC). There was very little excellence. Only 13 firms ended up with an “excellent,” and 35 received a “good” rating. 40 companies fell in the middle with “okay” ratings. At the bottom of the list, 45 received either a “poor” or “very poor” rating. Liberty Mutual improved the most. When we compared firms’ 2010 CxPi with last year’s results, we found that 22 companies had improved by at least five percentage points. Led by Liberty Mutual’s 15 percentage point increase, five firms even had double-digit improvements (Comfort Inn, Sprint, and Time Warner Cable). We also looked at the overall results for the 14 industries included in the CxPi. Retailers and ISPs are heading in opposite directions. We examined the industry results over the last three years of CxPi results. Of the nine industries that we’ve examined for all three years, two have been on steady paths. Retailers have improved every year, going from 78% in 2007 to 82% in 2010. ISPs, on the other hand, have dropped consistently from 62% in 2007 to 57% in 2010. TV service providers improved the most. We also examined the changes from last year’s CxPi. Led by a five percentage point gain from TV service providers, seven industries made improvements in their overall CxPi scores. Banks and credit card providers, on the other hand, had the largest declines. Consumers selected responses along a five-point scale – ranging from a very negative experience (1) to a very positive one (5). The individual indexes were calculated by taking the percentage of consumers who selected one of the top two boxes (4 or 5) and subtracting the percentage of consumers who selected the bottom two boxes (1 or 2). In order to limit consumer feedback to organizations that consumers are familiar with, we only asked consumers about organizations that they’ve interacted with during the previous 90 days. While we received feedback on many firms, the CxPi only includes the 133 organizations that had at least 100 consumer responses. The bottom line: There’s plenty of room to improve customer experience which will increase customer loyalty. measured in the future that is? Pelgrimsplekke: It’s like “Minority Report.” We know what consumers are going to answer in the future. Actually, as you guessed, it’s a typo which I’ve changed. Thanks for catching the mistake and bringing it to my attention. There’s another interesting finding that shows across the 14 industries, ie, some industries have tightly grouped scores whereas others show a much wider range between top and bottom performers. Compare, for example, banks with investment firms. Banks (61% to 83%) appear to show much greater variation in ratings than do the investment firms (51% to 85%). While some of this may be due to the number of firms rated in each industry, it also suggests that the leading banks have succeeded in differentiating themselves from the laggards to a much greater extent than has happened in with investment firms. Hi Bruce, how would a company go about getting an industry added to the CxPi? I am interested in seeing how my company rates in the CxPi. Very interesting info Bruce, thanks for sharing! I’m extremely surprised at some of the rankings. Macy’s and Target ahead of USAA and Schwab?!? It seems these rankings could vary widely for some retailers depending on the region surveyed. Are there any plans to extend the survey, both in breadth of questions and number of consumers? The rankings and your commentary are always interesting–thanks, Bruce. I was interested in how Liberty Mutual achieved their major improvement, and it led me on an interesting oddessey. Renee: The best way to get an industry included is to just ask. Which industry are you interested in? There’s not a lot of opportunity to add much, since we are about at our limit in questions for consumers. We’ve also done some custom work for companies who want to understand how they fare relative to their competitors. Tim: The respondents are representative of the US geography. Having said that, it is certainly possible for some variations in respondents by region to somewhat alter the results. I’d actually love to increase the consumer survey size (aren’t budgetary constraints a pain?!?) so that I could include additional brands. With enough of a sample I could also do a deeper geographical analysis. Tim: As for additional questions, there’s no plan to alter the 3 questions that make-up the CxPi, but we do ask a bunch of other questions in that same survey. So look out for my upcoming research on satisfaction across the customer lifecycle (researching, buying, using, and service), satisfaction with different channels (Web, phone, and in-person), likelihood to recommend, and several other areas. Hello Bruce, the industry I am interested in seeing included is IT services for education. The custom work sounds valuable so if you can let me know what it takes to get that started I would appreciate it. Thanks for responding Bruce. I look forward to the results of your upcoming research. I think the regional/geographical data would be extremely interesting, especially for retail brands like Macy’s who have grown through the acquisition of other brands (I never did like Foleys). I’m interested in the methodology where you subtract 1+2 from 4+5. Is it meaningful to do this with different experiences? I believe the strength of this approach in the NPS is that it is using the same behaviour so a ‘net’ score is meaningful. For example, you may have a very unenjoyable interaction with an undertaker following the death of a close relative, although the user experience is fantastic. You may then subtract this negative experience from a very enjoyable interaction with an online comic which actually has a poor user experience. It is conceivable to extend this simple example into differences in effectiveness and effort. I believe that your results will be strongly biased by differences in how effective/easy/enjoyable normal interacts are with the different companies therefore reducing the usefulness of this score in measuring real customer experience. Why is it absolutely no surprise to see the biggest banks in the nation at the bottom of the list of financial organizations?! They’re all a bunch of nickel and diming crooks, that’s why! JeremyP: I don’t think I’d describe the problems with big banks in quite the same way. I think they have problem with customer-focus, distractions from mergers and acquisitions, and a lack of executive commitment to customer experience. Thanks for sharing your opinion. Awhile back I posted a link about Liberty Mutual and the good work they were doing to improve their customer experience. Sadly, there is a follow up, which is about as far in the other direction as possible! Pingback: What do You think of iTunes? « thisisanexperiment. no, really. it is. Wow! Two consecutive wins for Barnes and Noble. That is something hard to achieve. Now, the question is, will they be able to retain their position on the next CxPi? An important point on looking at results such as those above is that while the data in this study is collected for large, industry leading(?) organizations, it’s also possible to apply the same thinking to small businesses. Customer experience service standards are often be written about for the largest and familiar brands – but small firms, with highly focused marketing and customer experience strategies, often surpass the big guys in their delivery. What was your criteria? Did you look at their IVRs to assess their customers’ experience and satisfaction. Thanks Bruce for this valuable post. I strongly believe that having quality customer services is absolutely essential for businesses to maintain healthy long-term relationship with customers and retain them in longer run. This is very interesting. It will be interesting to see this year’s data. Do you plan to do a similar post with 2011’s results? Does Forester use one single item to measure its three dimensions of customer experience …usability,useful and enjoyable..